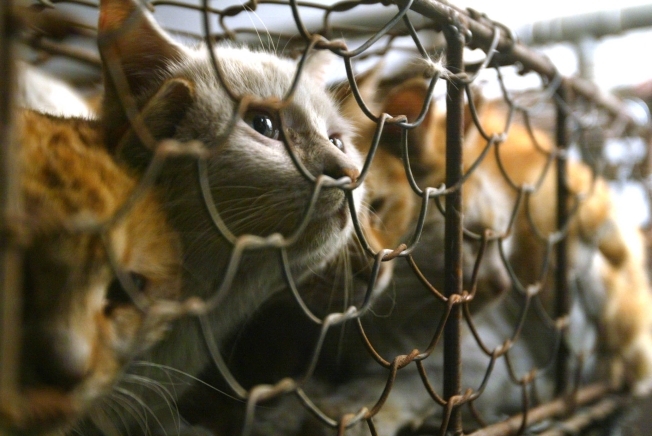 Cats are seen caged after being rescued by China Small Animal Protection Association from a Tianjin market that trade cats for meat and fur, in Beijing, in Feb. 2007. GUANGZHOU, China — While animal lovers in Beijing protested the killing of cats for food on Thursday, a butcher in Guangdong province — where felines are the main ingredient in a famous soup — just shrugged her shoulders and wielded her cleaver. "Cats have a strong flavor. Dogs taste much better, but if you really want cat meat, I can have it delivered by tomorrow," said the butcher, who gave only her surname, Huang. It was just this attitude that outraged about 40 cat lovers who unfurled banners in a tearful protest outside the Guangdong government office in Beijing. Many were retirees who care for stray felines they said were being rounded up by dealers. "We must make them correct this uncivilized behavior," said Wang Hongyao, who represented the group in submitting a letter urging the provincial government to crack down on traders and restaurants, although they were breaking no laws. The protest was the latest clash between age-old traditions and the new sensibilities made possible by China's growing affluence. Pet ownership was once rare because the Communist Party condemned it as bourgeois and most people simply couldn't afford a cat or dog. The protesters' indignation was whipped up by recent reports in Chinese newspapers about the cat meat industry. On Monday, the Southern Metropolis Daily — a Guangdong paper famous for its exposes and aggressive reporting — ran a story that said about 1,000 cats were transported by train to Guangdong each day. The animals came from Nanjing, a major trading hub for cats, the newspaper said. They were brought to market by dealers on motorcycles, crammed into wooden crates and sent to Guangdong on trains. A photo showed a cat with green eyes peering from a crowded crate. Some people in Nanjing spend their days "fishing for cats," often stealing pets, the report said. One cat owner in Guanghzou said people are afraid to let their pets leave the house for fear they will get nabbed. "It's never been this bad. Who knows, it might be because of the bad economy. I've heard that there are cat-nabbing syndicates from Hunan that are rounding up cats," said the man, who would only give his surname, Lai, because he feared the cat business might be run by gangsters. Animal protection groups have occasionally ambushed truck convoys loaded with bamboo cages filled with cats bound for Guangdong. In one recent case, hundreds of cats escaped after their cages were opened, though hundreds more remained penned in the vehicle. Lai Xiaoyu, who was involved in the attempted "rescue," said authorities couldn't stop the cat shipment because the traders said the animals were to be raised as pets. "The police did what they could, but there's little they can do to stop or punish those traders from shipping live animals," Lai said. People for the Ethical Treatment of Animals, or PETA, issued a statement Thursday decrying the cruel treatment. "China has no animal protection laws, and throughout the country scores of cats and dogs are bred or rounded up, crammed onto trucks and driven for days under hellish conditions to animal markets, where they are beaten to death, strangled or boiled alive," said a spokesman for the group, Michael V. McGraw. Guangdong is home to the Cantonese people, famous for being the most adventurous eaters in China. There's a popular saying: "The Cantonese will eat anything that flies, except airplanes, and anything with legs, except a chair." Zhu Huilian, a nutrition and food safety professor at Sun Yat-Sen University in Guangdong's capital, Guangzhou, said people usually eat cat in restaurants, not at home. "There's a famous soup called 'Dragon, Tiger and Phoenix,'" Zhu said. "It involves cooking snake, cat and chicken together. In winter more people eat cats as they believe it's extra nutritious." The wide-ranging Cantonese culinary tastes are on display daily in Guangzhou, also known as Canton, in the Qing Ping Market. Shopkeepers sit behind cages full of writhing snakes, tubs with turtles and plastic basins with mounds of scorpions crawling over each other. That's where the butcher, Huang, sells her meat, sliced on a blood-soaked cutting board in a stall filled with cages of chickens and rabbits. Hanging on a hook from its head — with its snout cut cleanly off — was a skinned dog with a long curly tail, paws with small clumps of fur still on them and black claws. The dog's jaw bone was displayed in a metal tray beneath the carcass. "The cat meat we sell comes from legitimate sources," said Huang, who gave only her surname because her boss doesn't allow her to speak to reporters. "It's from cat farms. The animals are raised the same way cows are." She said cat meat sold for about $1.32 a pound, while dog meat was cheaper, at about 95 cents a pound. Chicken was the best buy at 62 cents a pound, while lamb sold for about $1.32. Huang said customers had to order cat meat a day in advance because it doesn't sell as well as dog. "Cat tastes a bit like lamb. I don't like it much," she said. "Young cats are tender, but the meat on the older ones is really tough. Usually old people like eating it."